O-Cedar Liquid Wax Protects Wood. 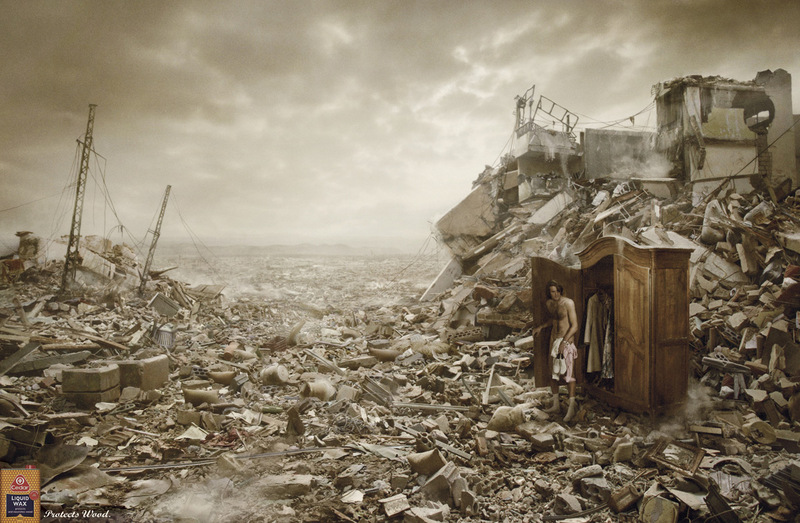 That’s the message in ‘Armageddon’, a print advertisement featuring a man emerging from a wooden wardrobe to discover the world has been destroyed. From the lack of clothes he’s wearing, he was in trouble before jumping into the O’Cedar-waxed wardrobe. The campaign is aimed at addressing the problem of falling furniture polish sales as a result of the growing popularity of furniture with laminate surfaces and of electrostatic wipes. Armageddon was created at JWT, Paris, Levallois-Perret Cedex, by creative directors Andrea Stillacci and Pascal Manry, art directors Xavier Beauregard and Yann-Gael Cobigo, account executive Florent Sallard, media planner Jose Da Silva, with photographer Vincent Dixon and retouching by Kilato.